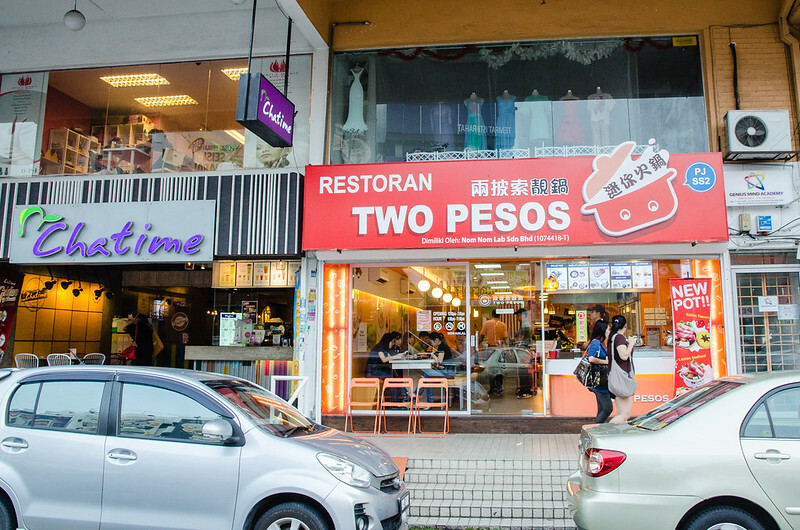 Two Pesos 两披索靓锅 is a Taiwan Mini steamboat / hot pot restaurant at SS2, Petaling Jaya. 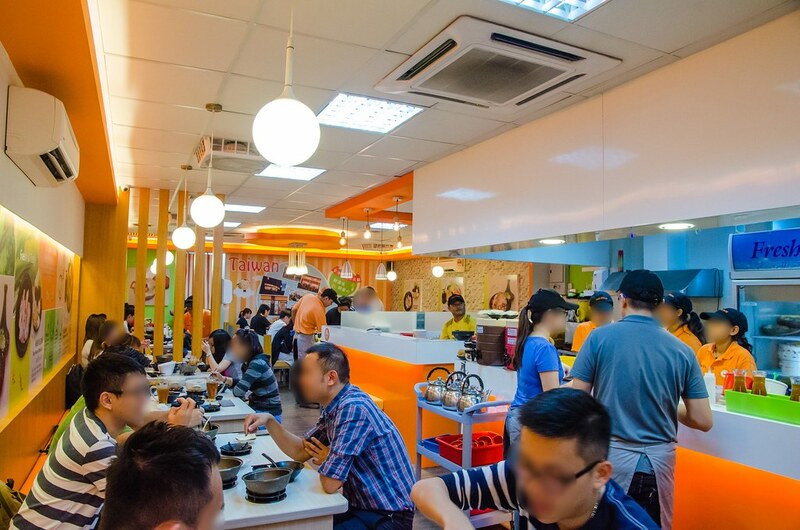 We noticed this restaurant when we went to buy Chatime which is next to it and it has since became our favourite place for a steamboat dinner that is nice and not expensive. 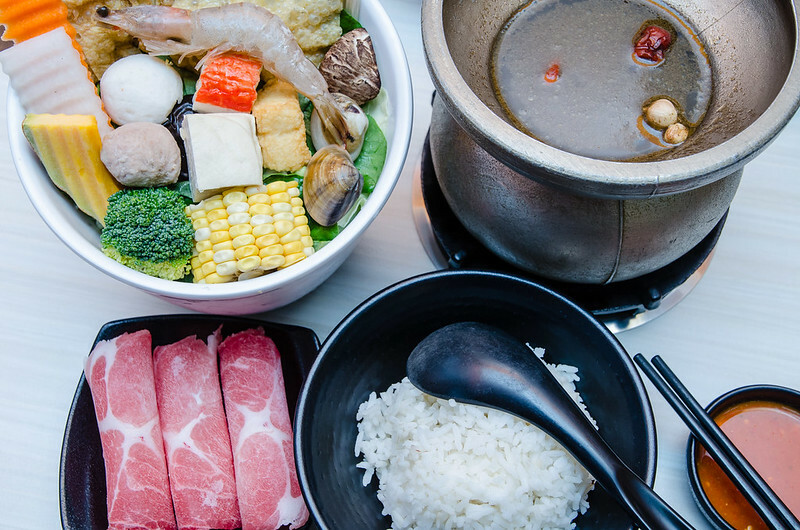 This steamboat / hot pot place is very different from our local steamboat restaurants as it offers many kinds of different soups and comes in mini personal pot. According to the website. 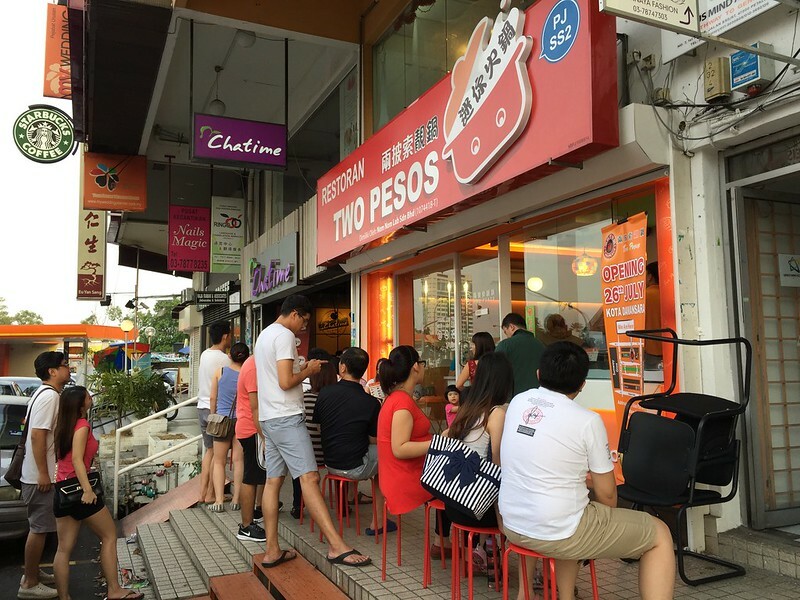 the soups at Two Pesos are invented by a golden awards winning chef, Ben Chen and his team. Two Pesos is originated from Taiwan. You can read more about its story here. Basically the owner and his wife met in Boracay and fall in love. Both of them have the passion of making food and beverages that can make people happy. So they decided to start this F&B business. The owner saw his Philippines coins during the shop name brainstorming and decided to name the business as Two Pesos. Pesos is the official currency of the Philippines. 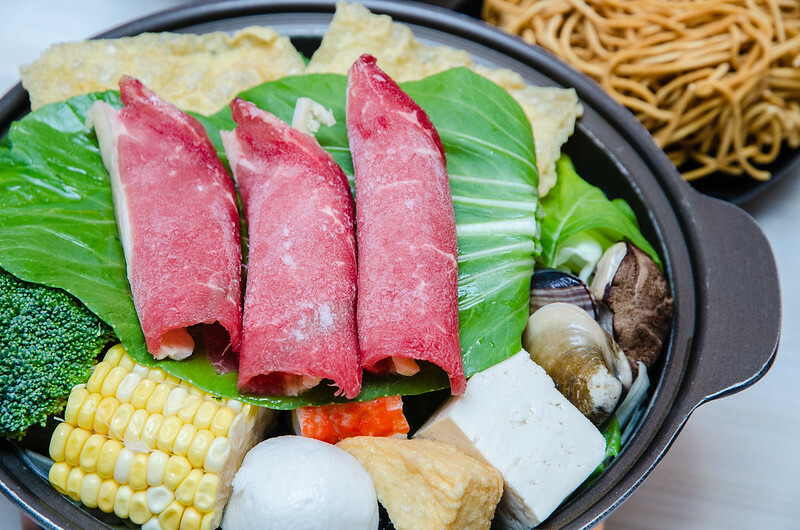 Enough with the history, let me continue with the steamboat / hot pot photos. Every table in Two Pesos has 4 gas cookers. 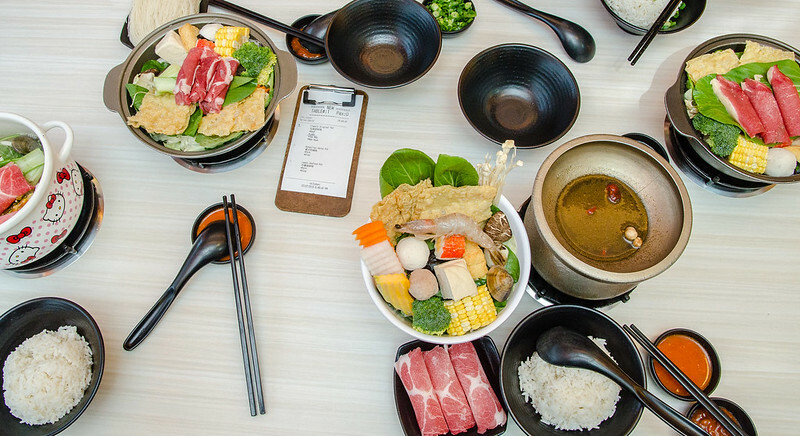 Here is an overview of our table with all our hot pot sets. This time I ordered the Mongolian Herbs Pot while laupoh ordered her Hello Kitty Lemon Seafood Pot. Our dinner gang ordered Two Pesos’ Original Classic Pot. Two Pesos’ Lemon Seafood Pot, RM 16. If you ask the waiter, he will tell you the soup tasted like tom yam but not spicy. 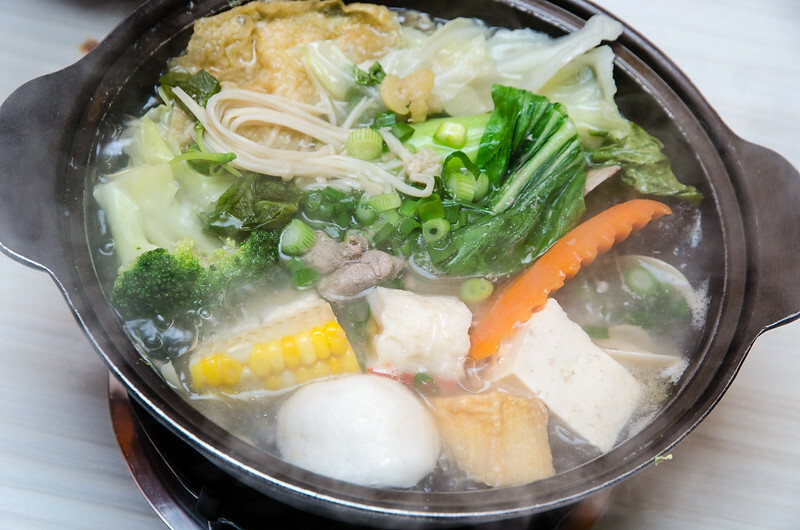 If you like sourness, this pot of steamboat is for you. 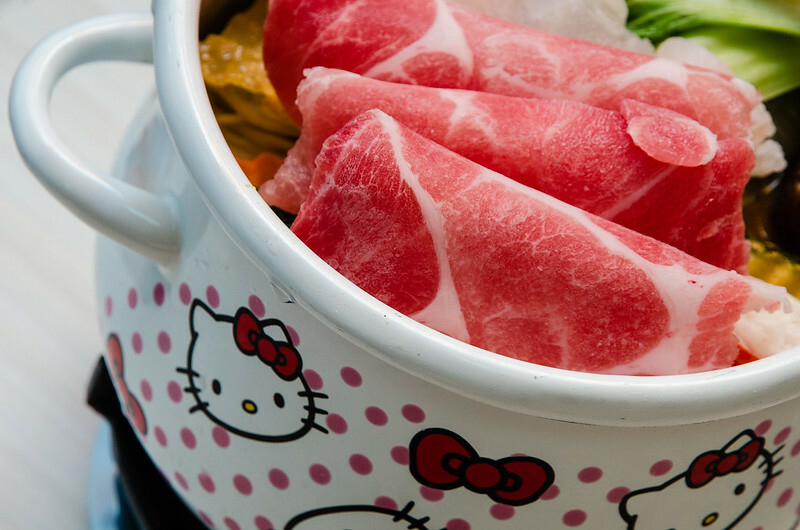 I’m not sure why it uses Hello Kitty pot though. Can anyone tell me what is the connection between lemon or sourness with Hello Kitty? Anyway it is very delicious and mix well with the ingredients. My Mongolian Herbs Pot, RM 15.50. The soup has special herbs from Mongolian, I guess. 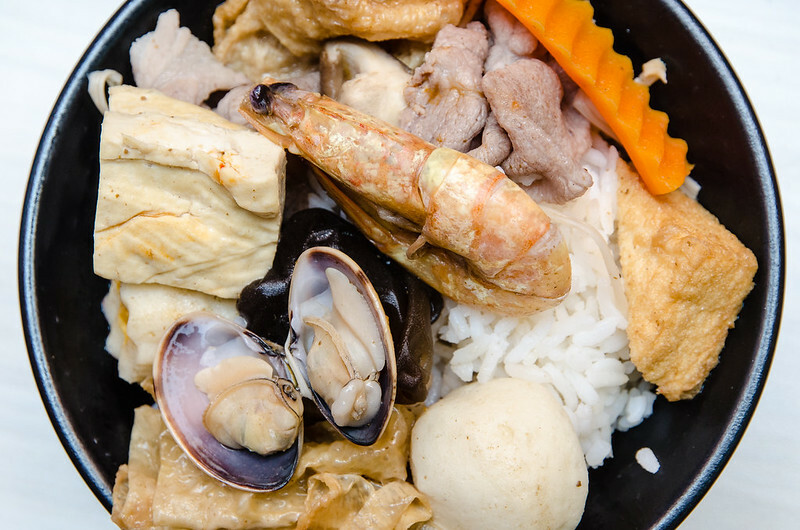 The taste is very unique and mix well with my steamboat ingredients. As you can see in this photo, I chose rice and pork slices for my set. You can choose from either pork, lamb or beef slices. For the carbohydrate, you can choose rice, yee mee or mee hoon. 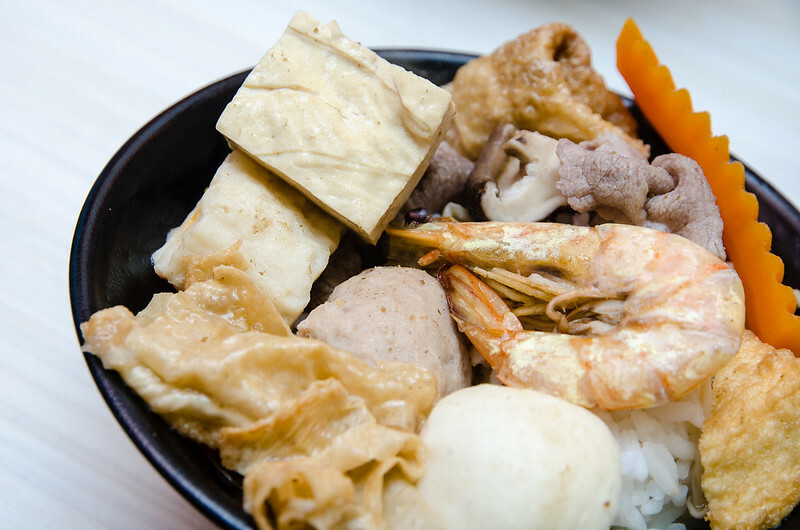 This is also different from other steamboat restaurant as they don’t normally has rice. 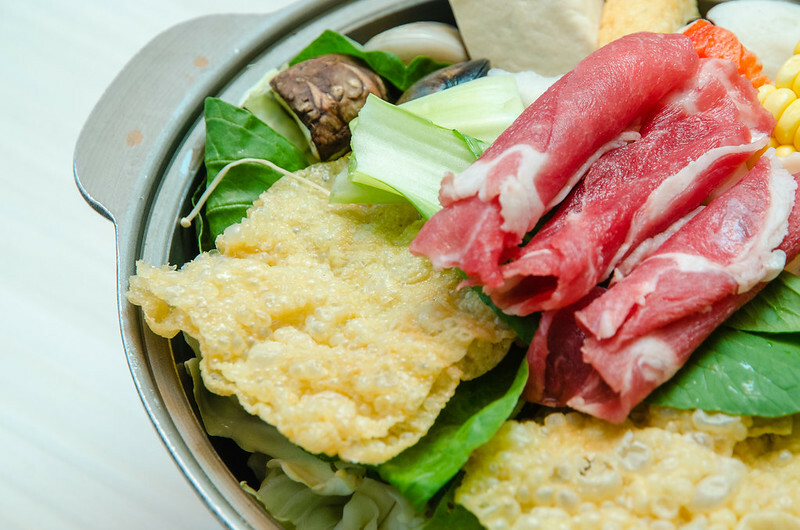 Original Classic Pot with beef slices, RM 11. This is the cheapest set at Two Pesos but you still get quite a lot of ingredients as you can see here. All the fresh ingredients are arranged nicely for you and has very nice presentation. 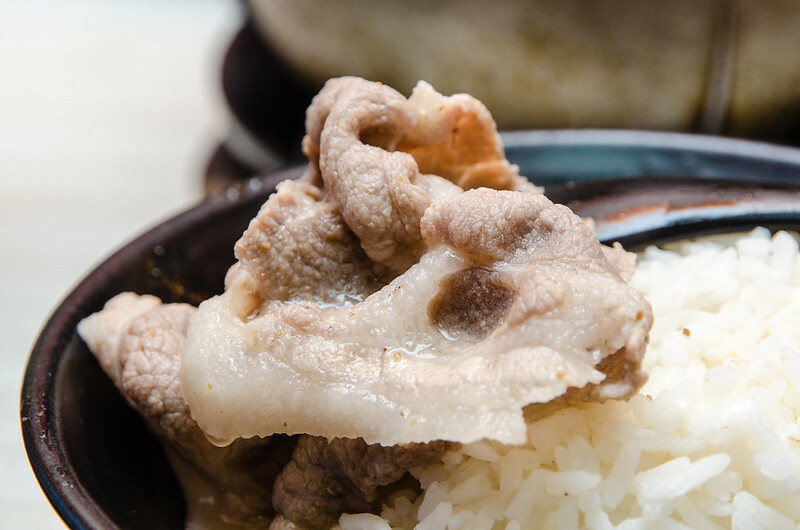 Original Classic Pot with pork slices. Quite a healthy meal as you have almost everything the body needed. Ingredients for my Mongolian Herbs Pot. The prawn here is not included. It is from laupoh’s Lemon Seafood Pot as she don’t eat prawn. 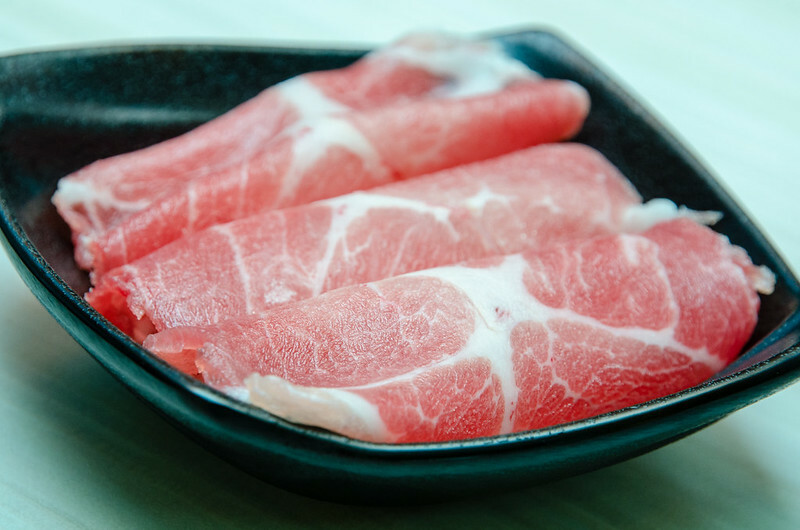 My plate of yummy pork slices. Some set they serve the meat on a plate, some set they serve the meat on the ingredients. Not really sure why. 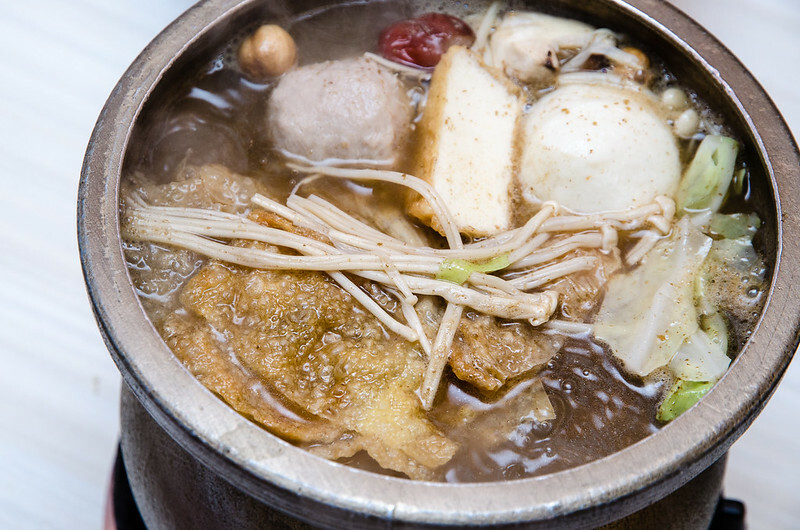 My hot boiling Mongolian Herbs hot pot. Can smell the nice aroma of the Mongolian herbs. Laupoh said smell a bit like Bak Kut Teh. My bowl of rice with cooked ingredients. The lala and prawn are fresh and juicy. My favourite steamboat ingredient, lala / clam. The pork ball and fish ball are delicious too. Fish ball is big but only half. If not enough, you can order add-ons for the balls for RM 4.20 per plate. My pork slice. Don’t cook this for too long to maintain the porky taste. Meat slices are also available as add-on for RM 6.50 per plate. 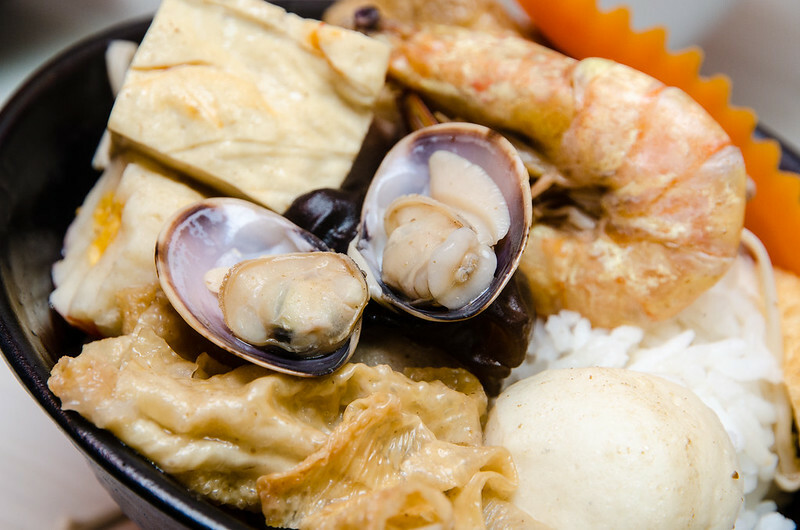 As seen in the video are the Tajine Seafood Pot (RM 18), Sour Greenings Pot (RM 15) and Taiwanese Sacha Pot (RM 11). The sauces selections for your steamboat / hot pot. Got bean paste, Sacha, spring onion, chili sauce, fried shallot and garlic mash. 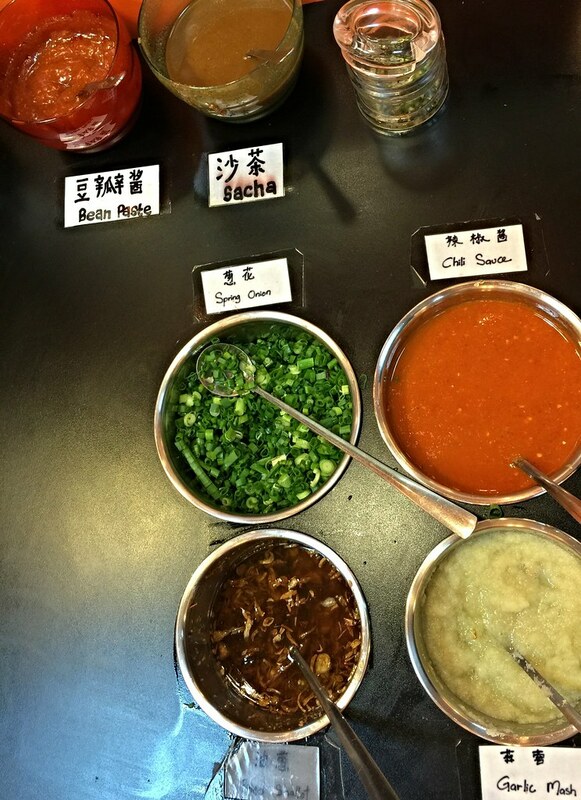 My favourite are bean paste, garlic mash and chili sauce. 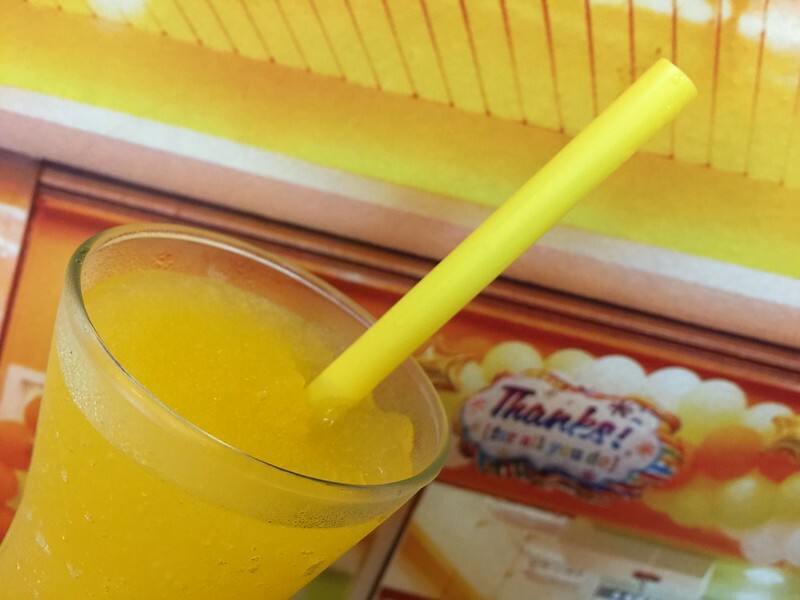 Our refreshing Passion Fruit Ice drink. RM 2.80. Very satisfying every time I cold down my throat after drinking the hot hot pot soup. Other beverages are Ice Lemon Tea, Lemongrass Tea and Kochabi Winter Melon Tea. 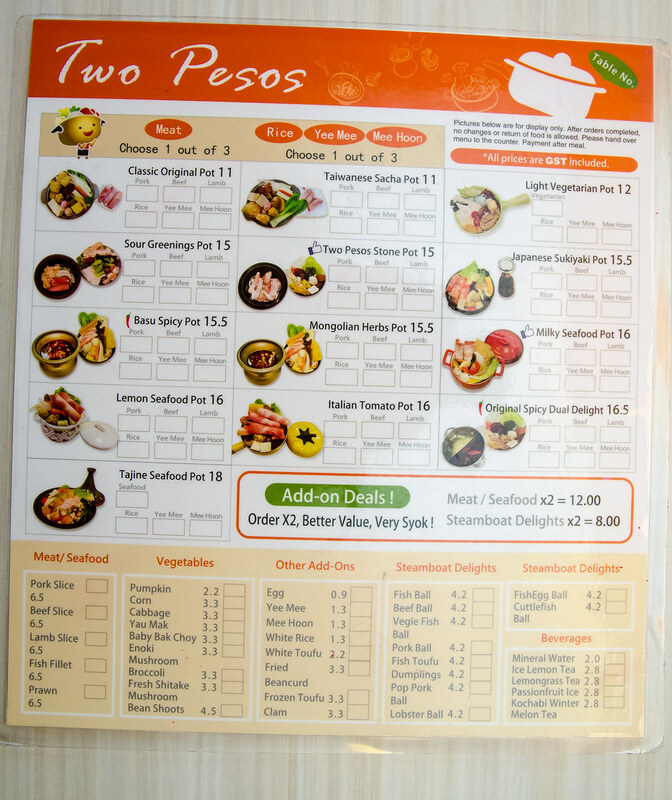 The Two Pesos’ menu. The staff will give you a crayon for you to mark your order. Then they will recycle the menu. Save paper, save tree and save the earth. The interior of Two Pesos. The staffs here are extremely polite and helpful. The decoration here at Two Pesos is warm and comfortable. Walls are decorated with hot pot details and photos from their shops in Taiwan. The entrance side at Two Pesos are all glass. 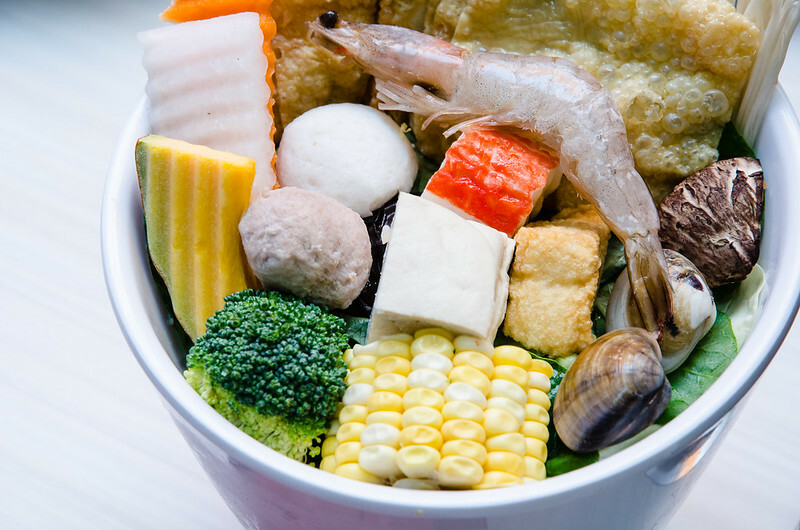 This is for passersby or queuing customers to drool over the steamboat / hot pot. The queue at Two Pesos. They do not accept reservation. When you reached here and saw people are queuing, faster go write down your name at the counter and they will call you when a table is available. 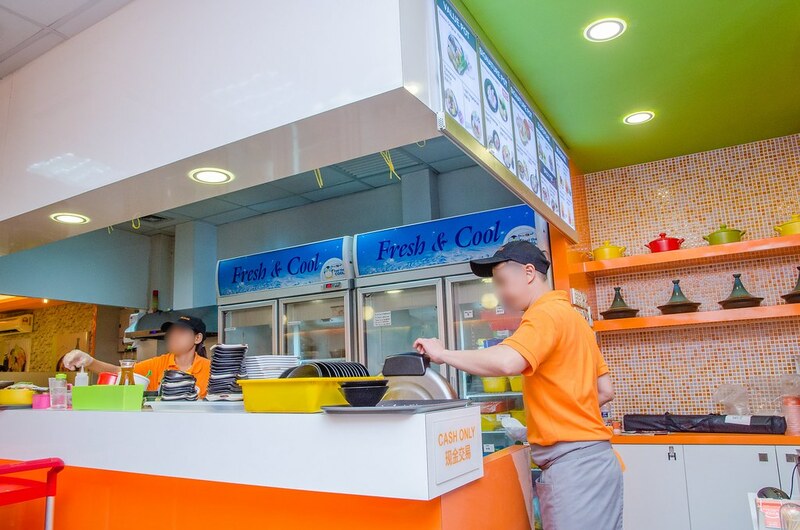 At the same time also the staff will give you the menu to mark down your order first. Two Pesos is located next to Chatime SS2. Coincidentally both also from Taiwan? 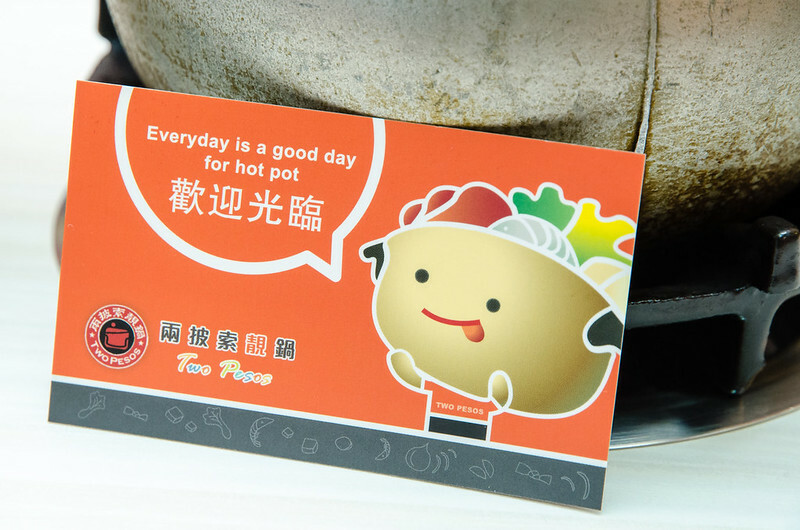 According to Two Pesos, everyday is a good day for hot pot. With so many choices of soup, I don’t really mind eating Two Pesos everyday. Cute Two Pesos name card. Licensing Opportunity is available too. Two Pesos is a non-halal restaurant. It opens for lunch from 12pm to 3pm. Then they rest and open again from 6pm to 11pm. 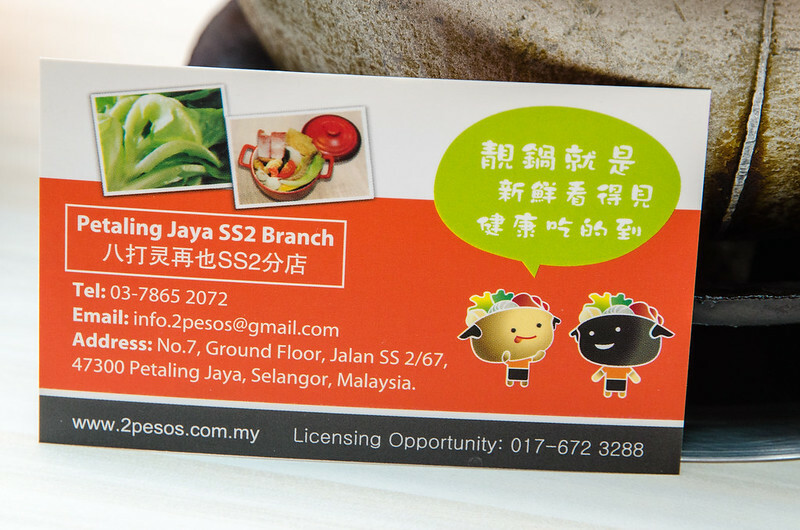 Two Pesos at SS2 is their first branch and they are going to open another one at Kota Damansara according to their Facebook. There will be a buy 2 free 1 promotion, so do not miss it! 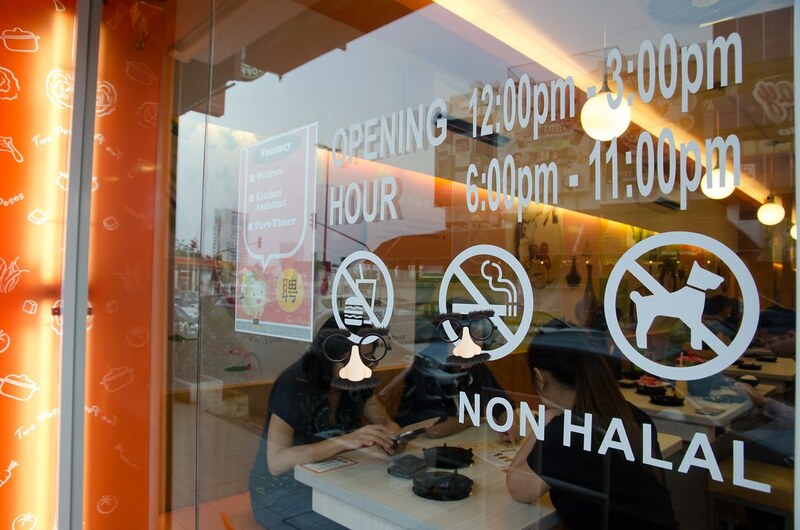 Business Hours: Everyday 12:00 pm – 3:00 pm and 6:00 pm – 11:00 pm. Come early to avoid the queue. WOW you got the Hello Kitty pot!! Sorry to hear about that. Hope they will improve. It is also one of my favourite place.